What is the most wonderful time of the year? To me, it is Christmas! I love this magical holiday with its fairy aura that infinitely embraces the whole world. I love Christmas because of its powerful magic that takes us back to childhood memories with joy and little bit of nostalgia. Magical winter lights are blooming and sparkling brightly everywhere. Christmas music is not going to go away. It helps people to stay in the winter spirit and feel more positive about the wonderland time. My family loves this time of the year. It brings us closer. It gives us more chance to enjoy each other’s company. We laugh a lot, we bake Christmas cookies, and of course we enjoy decorating a Christmas tree. We have a tradition every year of choosing a theme for our tree. This year is my choice to decide. My Christmas Tree Inspiration Is Tiffany Blue! Who does not love the movie Breakfast at Tiffany’s? It is not only a classic, wonderful movie, but moreover, it’s my most favorite theme for my Christmas tree and party styling. I am so thrilled and happy that my boys agreed with my choice. I have so many ideas of how to incorporate the timeless Tiffany Blue into holiday decor. Let the party styling begin! 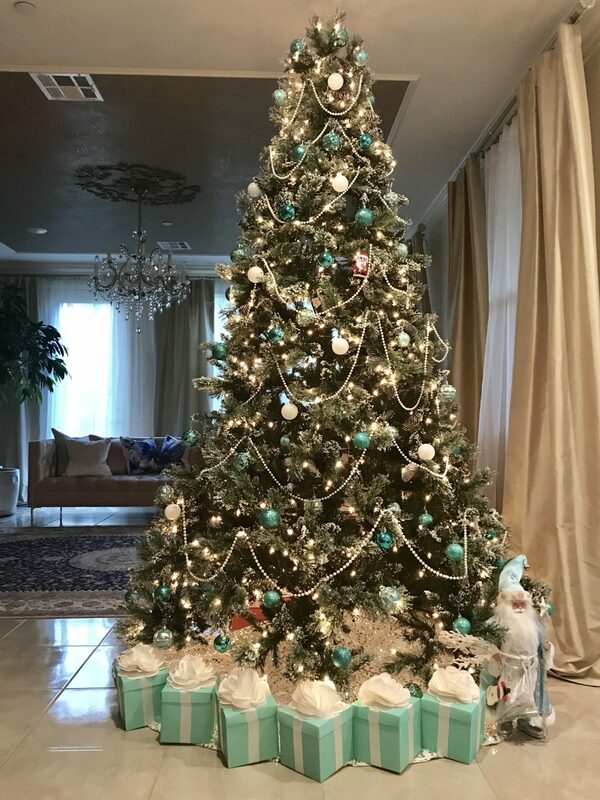 I will share all my ideas and steps gradually, beginning from the simple preparation of aqua blue ornaments and simple personal details that helped me achieve the Tiffany Blue Christmas Tree Look. I will help you decorate your tree with a low budget and make your home look cozy and luxurious at the same time. First, I decided to find a more suitable spot for my Christmas tree in the house. I wanted my new Christmas tree look to be noticeable and special. I prefer my Christmas tree to have artificial, sparkling snow that makes it more Christmasy. You can purchase any kind of tree you would like—it is your choice. To make my Christmas tree look more unique, I purchased a Christmas tree skirt in Home Goods that created a warm environment for the Tiffany Blue decor gift boxes. When I think of Tiffany I think of its colors of blue, white, and silver. So when planning the decor and ornaments for the tree, I wanted to reflect the Tiffany color scheme. For the tree’s garland, I chose Large Pearls Faux Crystal Beads strands to wrap around the tree, which elegantly glimmer and also accentuate the snow on the tree. It sparkles like real pearls under sunshine or light and is very gorgeous and dazzling. Having a Christmas tree hung with lights and ornaments is a great way to celebrate the holiday. The Glittering Aqua Christmas Ball Ornament Set helped to complete my desired look. My Tiffany Christmas tree has become the essential center piece to our home. My last decoration that will give a final Tiffany look is the Aqua Blue Centerpiece Box with Satin Ribbons & Ivory Tissue Paper Flower Bow. These amazing gift boxes are amazing for any occasion and the product by itself is very beautiful. Even the ribbons stuck on really well, even after a couple of adjustments. They are perfect for my Tiffany Christmas tree theme. I assembled several aqua blue boxes and put them around my tree. I am in love with my Tiffany Christmas tree! It is beautiful and full of magical spirit. It does not take a large budget or much effort to decorate. It just takes a lot of love. I wish all my readers a Merry Christmas!